The 17-year-old boy is accused of assaulting a staff member and causing €54,000 worth of criminal damage. 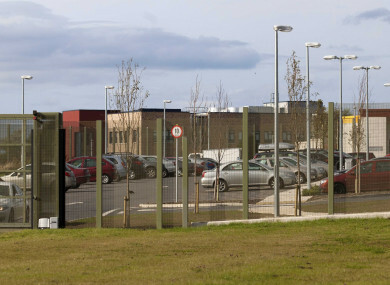 YOUTHS ARMED WITH metal poles and weights attacked staff and caused more than €26,000 worth of damage during one of a series of violent incidents at Oberstown young offenders centre. A Children’s Court judge has refused jurisdiction to hear the trial of one 17-year-old boy accused of assaulting a staff member and causing about €54,000 worth of criminal damage. The facility in Lusk in north County Dublin is the State’s main place of detention for offenders. The 17-year-old boy, who cannot be named because he is a minor, is accused of taking part violent incidents on four dates and faced a preliminary hearing at the Dublin Children’s Court to decide his trial venue. Judge John O’Connor held that the case was too serious to accept jurisdiction and he held that the youth must be tried in the Circuit Court which has tougher sentencing powers. He is charged with theft of an electronic security key fob, assaulting a male unit manager and criminal damage to security doors, a locking mechanism as well as glass security windows and a door on 31 October last year. He is also accused of causing damage to furniture and electronic equipment including a CCTV camera at the detention centre on dates in January, February and September last year. In an outline of the allegations Garda Sergeant Eoin McDonnell told Judge O’Connor that during the incident on 31 October last, the boy stole a key fob from a staff member and with a second youth armed themselves with a metal pole and weights and caused €26,617 worth of damage. One detention centre worker who tried to disarm the boy was punched in the head and face. The court heard claims that on 8 September last the boy picked up a laptop and threw it at a teacher who feared for their life and left the room. The boy then caused damage costing €14,059. It was alleged that on 2 February last year, the boy became aggressive to staff who feared for their safety left a room where the boy then caused €9,190 worth of damages. The first incident is alleged to have taken place on 3 January last year. Garda Sergeant McDonnell said it was claimed the boy became aggressive to a staff member in the detention centre and caused €4,366 worth of damage over a four-hour period. He made full admissions when arrested, the court was told. The total amount of damage in the four incidents was €54,226, Garda Sergeant McDonnell said. The boy, who was accompanied to court by his grandmother, did not address the court. Damage was caused to windows, security cameras and a couch during the incidents, the court heard. The sergeant agreed with the defence that the boy was not the main instigator in the incidents, three people had been involved. Garda Sergeant McDonnell described the boy as being the “middle perpetrator”. The court heard that the youth is still being held at the detention centre. The defence asked Judge O’Connor to note that the incidents go back some time. His grandmother was described as being “the only constant in his life” as his parents had drug addiction problems. A folder was handed to court outlining projects and a range of work he has done in custody. The case would be dealt with quicker it remained in the Children’s Court, his lawyer argued. However, Judge O’Connor held it was too serious. The case was adjourned for a book of evidence to be prepared by the prosecution. Comments have been closed due to ongoing court proceedings. Email “Teen accused of causing €50k damage at Oberstown young offenders centre”. Feedback on “Teen accused of causing €50k damage at Oberstown young offenders centre”.